“Compared with current lenses, our graphene lens only needs one film to achieve the same resolution. In the future, mobile phones could be much thinner, without having to sacrifice the quality of their cameras. Our lens also allows infrared light to pass through, which glass lenses don’t,” says Professor Baohua Jia, a research leader at Swinburne’s Centre for Micro-Photonics. 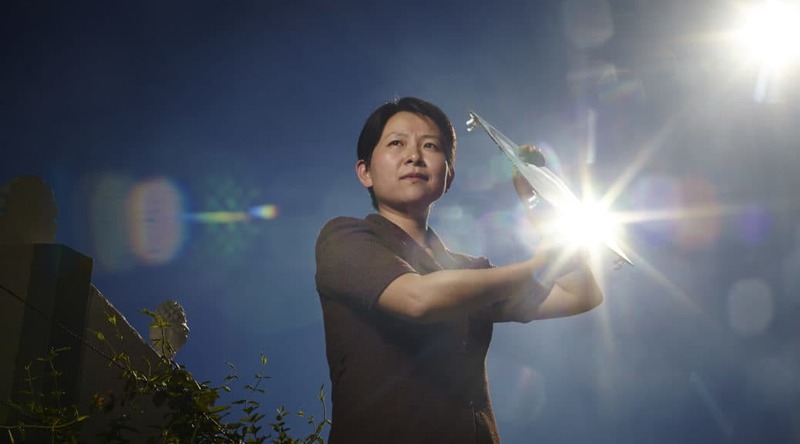 Producing graphene can be costly and challenging, so Baohua and her colleagues used a laser to pattern layers of graphene oxide (graphene combined with oxygen). By then removing the oxygen, they produced low-cost, patterned films of graphene, a thousand times thinner than a human hair. “By patterning the graphene oxide film in this way, its optical and electrical properties can be altered, which allowed us to place them in different devices,” Baohua says. Warm objects give off infrared light, so mobile phones with graphene lenses could be used to scan for hotspots in the human body and help in the early identification of diseases like breast cancer. By attaching the lens to a fibre optic tip, endoscopes—instruments that are currently several millimetres wide—could be made a million times smaller. Baohua’s work on graphene lenses was published in 2015 in Nature Communications. The team is also investigating graphene’s amazing properties for their potential use as supercapacitors, capable of storing very large amounts of energy, which could soon replace conventional batteries. Baohua’s work has also contributed to the development of speedier telecommunications, and cheaper and more efficient solar cells.